DTE Kerala M Tech 2014 admission online application has been invited. 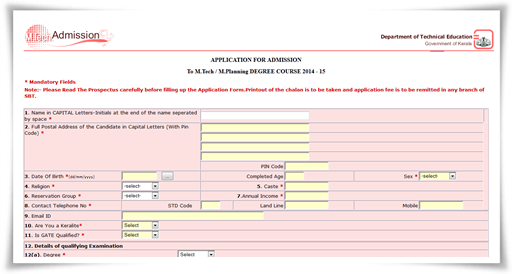 The Department of Technical Education, Government of Kerala has invited applications for admission to Post Graduate Degree Course in Engineering for the year 2014. The PG course which is extended over a period of 24 months consists of 4 semesters. Applications should be filled online through the official websites while the online facility for submission of application will be available till 24.06.2014. The Department of Technical Education, Government of Kerala has invited applications for admission to Post Graduate Degree Course in Engineering for the year 2014. The PG course which is extended over a period of 24 months consists of 4 semesters. Details regarding the institutions which offer P.G. Course in various disciplines can be known from the updated prospectus published for 2014. More than that, the applicants can know about the list of Government & Aided Institutions with M.Tech Programmes offered there along with eligibility and number of seats offered. 15% seats are reserved for SC/ST Candidates while 3% seats are reserved for physically handicapped candidates. Applicant should have scored a minimum of 60% aggregate marks in the Engineering Degree examination along with other academic qualifications. Those who have appeared for the final semester examination can also apply if he / she has passed all the subjects up to which include the 6th semester exam (8th semester for B.Arch students). Applications should be filled online through www.cet.ac.in or www.dtekerala.gov.in, the official websites whereas the online facility for submission of application will be available till 24.06.2014. While during submitting online application, candidates should have to keep the required documents which can be used to fill respective columns. The selection of Candidates will be supervised by the selection committee consisting of the Director of Technical Education (Chairman) and other, the Senior Joint Director (ECS) and the Principal, College of Engineering, Thiruvananthapuram. For those who wish to apply for the M tech course which comes under the Department of Technical Education, the following dates would be more helpful.